Home News Elections 2018 Voters Trickling in for 2018 Primaries; Polls Open Until 7 p.m. Voters Trickling in for 2018 Primaries; Polls Open Until 7 p.m.
A slow turnout for Saturday’s 2018 Democratic primary saw 3,749 voters turning in ballots as of 3 p.m., according to numbers provided by the Election System of the Virgin Islands, and still counting. That number is about 11 percent of the 32,406 registered Democrats in the territory, 15,511 on St. Thomas, 15,825 on St. Croix and 1,070 on St. John. The polls remain open until 7 p.m.
As of 10 a.m., three hours after the polls opened, some 647 voters had cast their votes in the St. Croix, while some 630 voted on St. Thomas and St. John. By 12 p.m., those numbers went up to 1,176 for St. Thomas and St. John, and 1,157 for St. Croix. As of 3 p.m., some 1,920 voters cast their ballots on St. Thomas and St. John, and 1,829 on St. Croix. 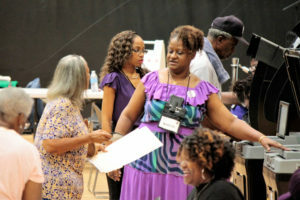 At UVI’s Sports and Fitness Center, a poll worker for the Ulla Muller Elementary School polling site instructs a voter on how to use the DS200 tabulator. The University of the Virgin islands Sports and Fitness Center on St. Thomas – a new polling station that serves Gladys Abraham Elementary School, Ulla Muller Elementary and Addelita Cancryn Junior High – saw a combined number of 109 voters as of 10 a.m. on Saturday. Jasmine John, supervisor at the Juanita Gardine polling station on St. Croix, said it was a slow turnout, with 61 ballots cast as of 10 a.m., increasing to around 102 by the 12 p.m. count. At the Lockhart Elementary School, four polling stations shared a packed space: Winston Raymo Recreational Center, Oswald Harris Court, Charlotte Amalie High School Gym and Joseph Sibilly Elementary School. Jacqueline Callwood, poll judge for CAHS gym, said turnout as of noon was relatively low but she expected more voters trickling in as the day progressed. 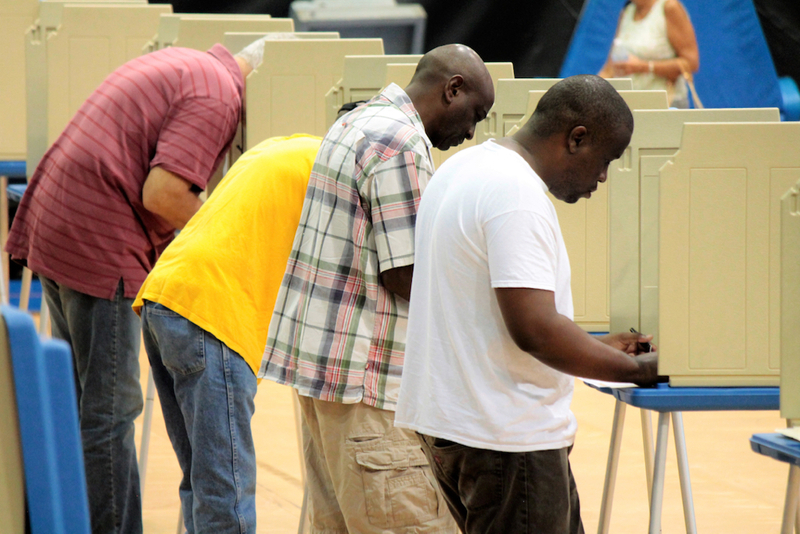 “Voters normally come in on their lunch hour between 12 p.m. to 1 p.m. when they have time off and they could come from their jobs and get to vote, and then they return to work,” said Callwood. According to poll judges, the lower turnout compared with the numbers for the 2016 primary election day could be due to voters taking advantage of the early voting period. 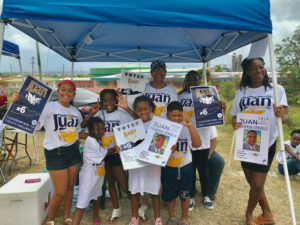 When early voting ended on July 25, a total of 3,521 voters had cast their ballots: some 1404 voted on St. Croix; 2,038 on St. Thomas; and 79 on St. John, according to the Election System. Those numbers combined with the 3 p.m. tally brings the total of votes cast so far to 7,270 votes, or about 22 percent of the territory’s registered Democrats. “The early voting, a lot of people caught on to that and the convenience of voting early and not having to stand in line, so that’s a plus. 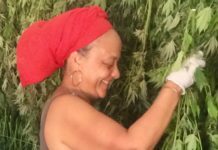 It’s a good thing,” said Phillip, who added that by the end of the day, she expected a combined number of a little more than 1,000 ballots cast in the UVI Sports and Fitness polling station. St. Croix voter Darwin Simmonds, meanwhile, simply said the turnout was slow because it was the primaries. “I look forward to the general election with more voters,” said Simmonds. Voters seemed to encounter the same problems in the voting process as the last few election cycles, when the Election System began using the DS200 tabulators. Some voters at Lockhart Elementary ended up with spoiled ballots because they either did not completely shade the bubbles next to candidates’ names or marked them with checks instead of shading them. In such cases, the DS200 would not accurately record the votes. Voters did get a few chances to fill in new ballots after the old, incorrect ones have been properly isolated in spoiled ballot boxes. “It’s not a matter of not knowing what to do. I call it voters’ jitters, I guess” said Phillip. Outside the polling sites, supporters make last-minute pleas for their favorite candidates. There were minor glitches with the voting machines at the Lockhart Elementary polling station, according to Callwood, but nothing severe that would have caused a delay. At the Lockhart station, voters showed a preference for the old way of casting their votes, filling in their paper ballots and feeding them into the DS200s to be tabulated. Although some needed extra instructions from poll workers on how to use the DS200s, the process still took a mere few minutes. Some voters did try the new ExpressVote method: they insert a rectangular piece of card issued by poll workers into the ExpressVote machine, enter their votes on a computer screen, then waited for the computer to print their selection onto the card. While they still need to feed these cards into the DS200 for tabulation, the new ExpressVote does make for a faster voting experience. “I guess they need some more education on the fast ExpressVote, so once we get that together, then a lot of people will start to choose that method,” said Callwood. 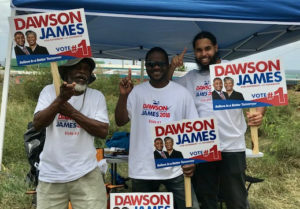 Electioneering – in which candidates’ teams campaign too close to or within the polling sites – did not seem to be an issue this year, at least in St. Thomas polling places. The various tents advertising the names and faces of various Democratic candidates kept an easy 200 feet away as required by law. That is not to say the campaigners did not muster an energetic last-minute push for for their candidates. Voters driving to polling places got stopped by enthusiastic campaign volunteers waving brightly colored placards and yelling out their candidates’ numbers on the ballot. Voters who spoke to the Source seemed both hopeful and thoughtful about voting in the primaries this year. Taking part in the political process is a family affair. Norma “Sheppy” DeJournette, also a voter on St. Croix, said she asked herself if the candidates know how to handle billions of dollars in funding, and if voting for new people will affect ongoing public projects. “Will projects and processes already started stop because people who started them are gone and new people come in?” DeJournette shared. Before the polls close at 7 p.m., Phillip strongly encouraged registered voters who are still on the fence about coming out to vote in the primaries to head to the polls immediately. “It’s very important. You have no say if you don’t vote,” said Phillip who has been voting and volunteering in polling places since she was 18. “You can’t complain if you don’t do something to make a difference,” said Phillip.